One of my friends is pregnant with baby #2, so naturally, that means a quilt was in order! I decided to do a space themed quilt. I found a wonderful batik, navy blue with gold stars and decided to make that the foundation of the quilt. For the front, I'm using this quilt (scroll to the bottom) as my inspiration. I've even found a site that will allow me to scale the planets and sun accurately! For the back, I wanted to try out paper piecing. 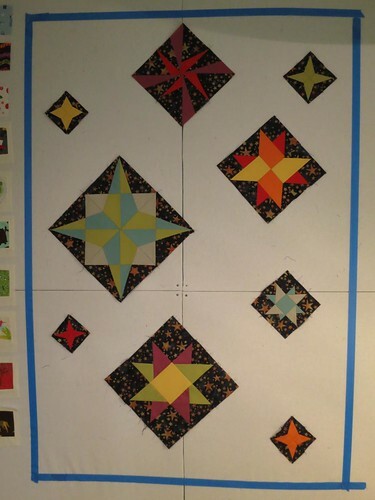 Each of the four large blocks you see is paper pieced. The smaller stars are all improv pieced. The colors I am using here are the same colors I will use on the front. As you can see "front" and "back" will mean almost nothing on this quilt, as both will be very open and free form. : ) I started with the back first, because I wasn't sure how long the paper piecing would take (answer: very much longer than normal piecing, but egads I love those results!). My next step is to fill in between the stars with the background material in order to finish the back. Then I'll start making planets for the front. My plan is to applique those down, with the smaller ones being freezer paper applique, by hand, and the larger being backed with muslin, then cutting the muslin and turning them right side out. Those shapes will get sewn on by machine. I'd like to hand embroider a label, we'll see if I have time....the goal is to get this quilt done and out the door before the end of April.